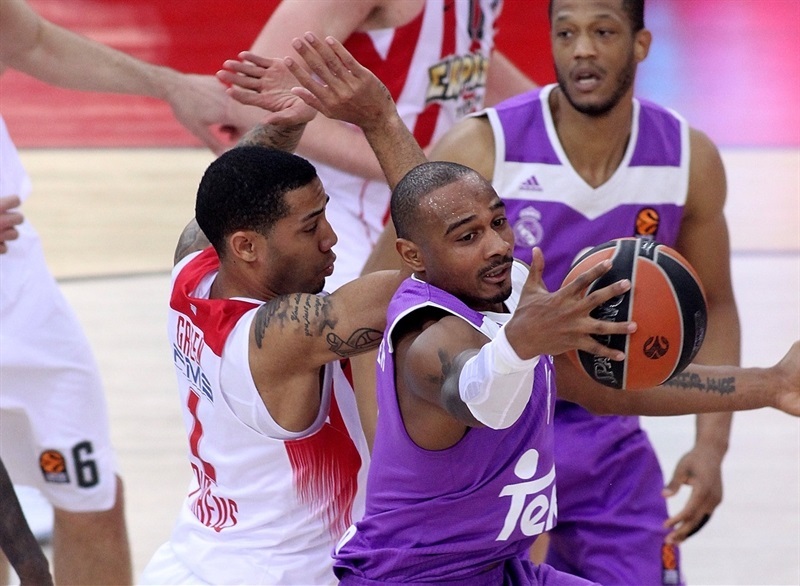 In a battle of two teams that have already secured home-court advantage in the playoffs, Real Madrid secured a top-two finish at the end of the regular season with a hard-fought 73-79 win over Olympiacos Piraeus at Peace and Friendship Stadium on Friday night. Madrid improved to 21-7 and left it in the driver’s seat knowing two wins in the last two games will secure it first place at the end of the regular season. 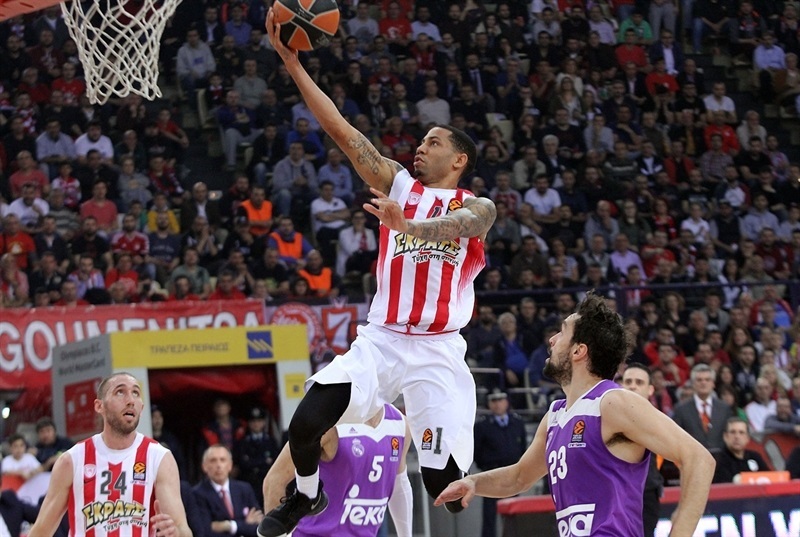 Olympiacos dropped to 19-9 and remains in the third place. 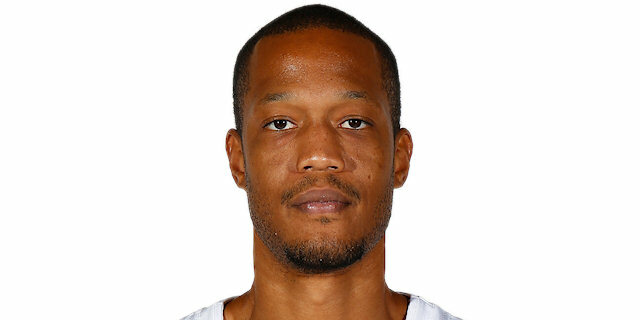 Neither team had a double-digit lead the entire night, but Madrid’s Anthony Randolph and Sergio Llull, scoring 21 points apiece, got the better of the Olympiacos defense and kept the visitors in front throughout the fourth quarter. Llull also dished 5 assists, while Randolph pulled down 5 boards and had 4 blocks. Othello Hunter scored 10 points in victory. Nikola Milutinov paced the hosts with a career-high 18 points, Kostas Papanikolaou added 11 points and 6 rebounds and Dimitrios Agravanis scored 10 for Olympiacos, which played without Georgios Printezis due to illness. The teams traded blows the entire first half. 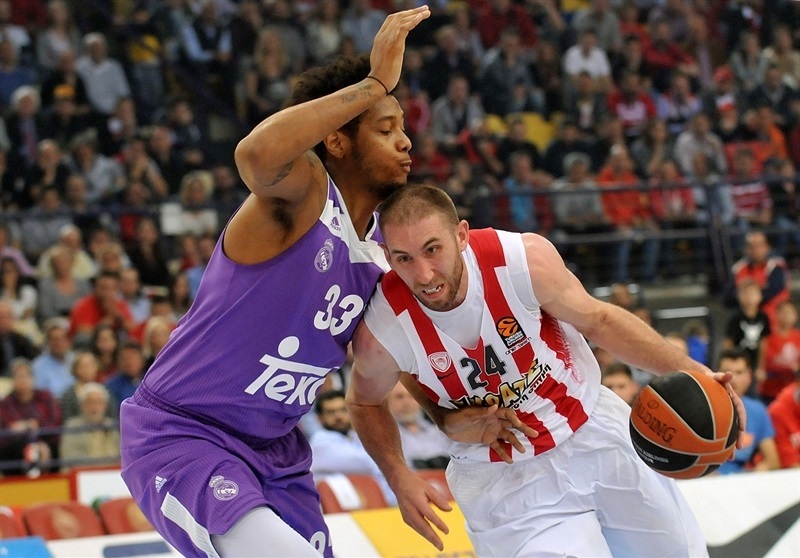 Olympiacos was the team to go in front first, with Milutinov scoring 9 points and grabbing a pair of offensive rebounds. An offensive board by Papanikolaou led to a big dunk from Ioannis Papapetrou and an 18-10 lead. But after a timeout, Llull and Randolph scored 9 points, including a Llull three-pointer in the last second that cut it to 20-19 after 10 minutes. The second quarter alone featured nine lead changes and four ties. Erick Green and Matt Lojeski nailed threes for the hosts, but Randolph scored on two fast breaks and hit a corner three-pointer. The teams were appropriately tied at 37-37 at halftime, then each made its own runs in the third quarter. 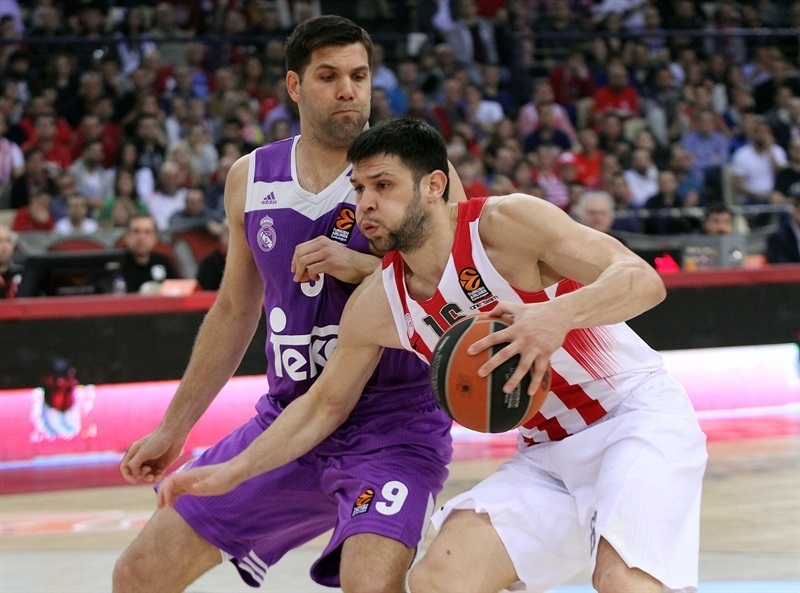 Papanikolaou and Vassilis Spanoulis hit triples at the start of the third to opena 6-point lead for the hosts, but three-pointers from Jeffrey Taylor and Jonas Maciulis got Madrid back within a single possession. 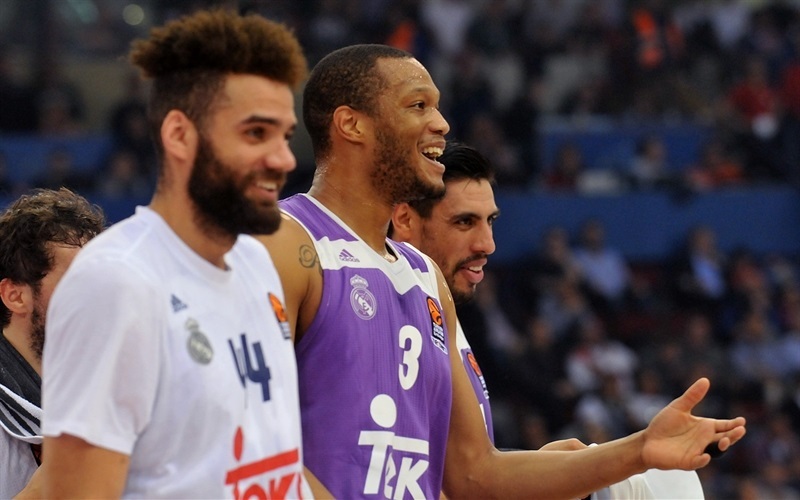 Randolph and Llull hit tough shots, and Llull also nailed a three-pointer that got Madrid in front 52-56. It turned out the visitors took the lead for good. Madrid led 54-58 going into the fourth quarter and Randolph made a pair of tough baskets before Hunter added a tip-in and put through the rim a tough alley-oop pass from Llull. That made it 60-68, and a Llull basket opened a 63-72 advantage. 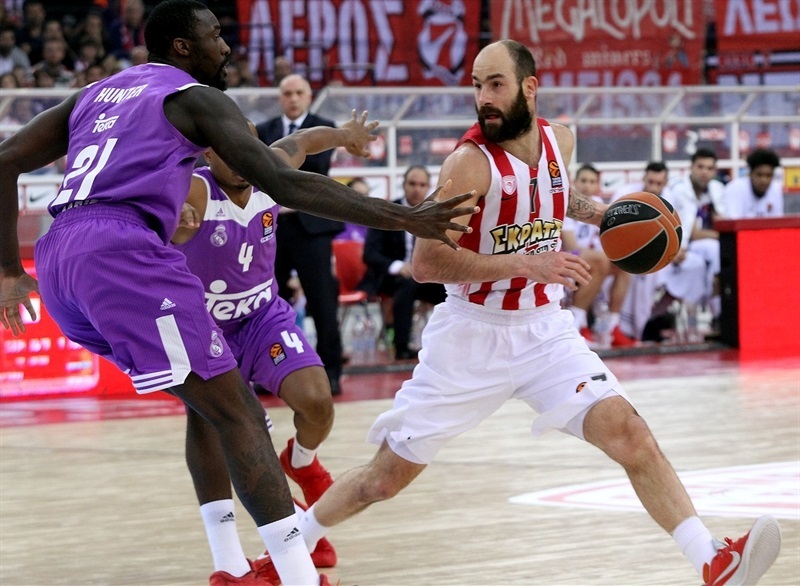 Olympiacos made another charge, with Vangelis Mantzaris driving to the hoop, Spanoulis hitting from long range, and Papanikolaou fighting for a close-range basket that made it 70-73. But in the final minute, Llull went length of the floor for a fastbreak layup, before Randolph’s free throws sealed the deal. 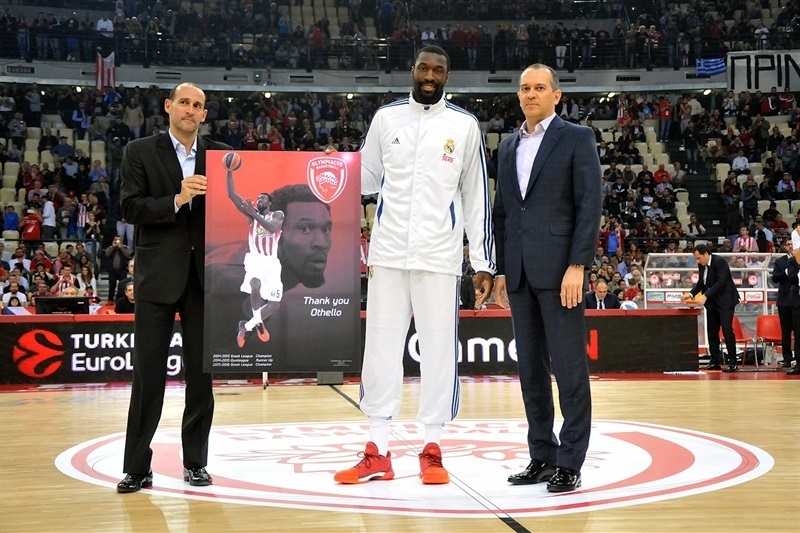 "Unfortunately, we lost one derby against the team that is one of the favorites to win the EuroLeague. But we are very worried about the situation with Matt Lojeski. This is the most important thing now, to make tests and see what the exact injury is. I think in the game it was a body-to-body fight, and in the end Madrid got a small lead that was enough to win the game. We managed to keep the game in low scoring for them, because they average 90 points. Of course, we could have avoided some easy points we gave up, especially on fast breaks, and from the other side, I think we missed a lot of layups and missed seven fast breaks, including turning the ball over twice. We have to continue, we want to fight in the last two games as much as we can, and see where in the standings we can finish. I want to thank all the fans that came to support us tonight, and I hope we will be sold out every time until the end of the season, just like tonight." 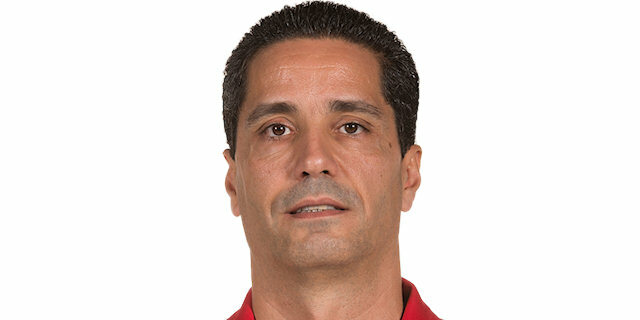 "First, congratulations to my players on victory. We know how difficult is to win here against Olympiacos, which is a great team with a lot of heart. We had a very solid performance. We had some problems on our defensive rebounds; Milutinov did a great job, pounding and rebounding close to the basket. But we were able to contest that in the second half, and after that we had more control of the game. I am happy for the victory, but sad because the news for Matt Lojeski doesn’t look good. I hope his injury is not that difficult." "Stuff was going my way tonight. I think with our team, on any night anyone can take over. So many guys can play great, and tonight it was just my night. Our main objective is to get ready for the playoffs, make it to the Final Four, and ultimately win the title. My face might not show it, but I am having fun every time I play basketball. I love it and I am blessed to do it."